Preliminary Survey of Hatteras Inlet North Carolina. Preliminary Survey of Ocracoke Inlet North Carolina. This is an attractive 1857 map of Hatteras Inlet and Ocracoke Inlet, North Carolina. 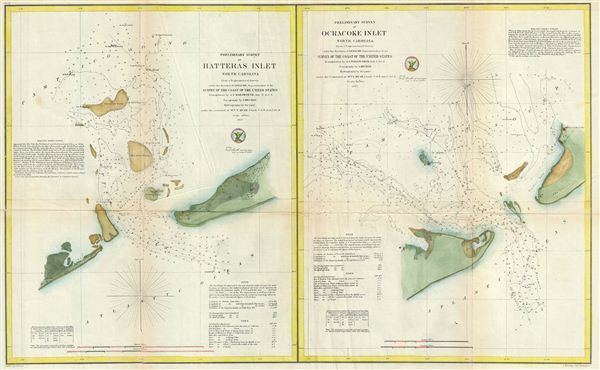 essentially two maps on a single sheet, Hatters Inlet occupies the left quadrants while Ocracoke Inlet is on the right. Both Hatteras Inlet and Ocracoke Inlet are part of the Cape Hatteras National Seashore and allow access from the Atlantic to the Pamlico Sound. Hatteras Inlet is an estuary located on the Outer Banks of North Carolina and is an estuary separating Hatteras Island and Ocracoke Island. Ocracoke Inlet, also an estuary, separates Ocracoke Island and Portsmouth Island. Oracoke Island was the first inlet in the Outer Banks and played an important role in American history, including settlement of Roanoke Island, the death of the Pirate Blackbeard, and the American Revolutionary War. Storms in 1848 opened Hatteras and Oregon Inlet, lessening the vital importance of Ocracoke Inlet by providing alternate access points to the Pamlico Sound. The triangulation upon which these charts were based is the work of A. S. Wadsworth. The topography for these charts was compiled by J. Mechan. The hydrography was accomplished by a party under the command of William T. Muse. Bache, A. D., Report of the Superintendant of the United States Coast Survey, (Washington) 1857. Very good. Some wear and toning on original fold lines. Minor repair upper right fold intersection. Some additional wear and creasing to left and right of main fold. Backed on archival tissue for stability.